Guitar Hero for kids, or something more? When most people see the Disney logo on anything, they have an automatic and polarized reaction, somewhere between childlike longing for the carefree days of yore and visceral disgust at the today's bastardization of Walt's original vision for a family-friendly group of parks and films that were of the highest quality available in the world. Personally, I fall more into the former group than the latter, although I can't help but acknowledge the Eisner Effect and some of the more corporate decisions made by the company in recent years. All of that said, no one can deny that the original Fantasia is a true classic and a work of art, as well. Questionable corporate decisions aside, I believe they made a good call in creating Fantasia: Music Evolved. It is by far the best Kinect game released since Microsoft put out the oft-maligned piece of hardware. Although there were some minor glitches, they were few and far between. 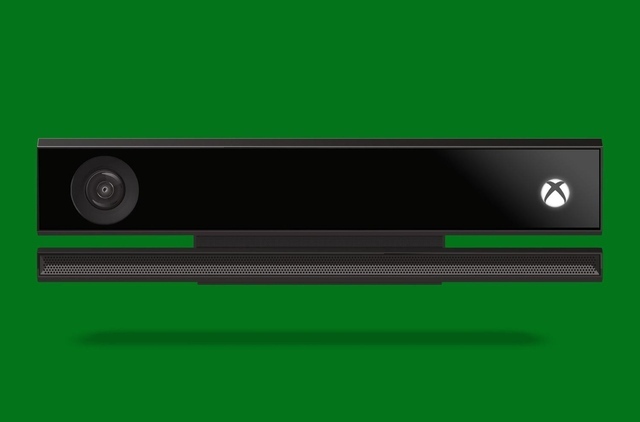 For the vast majority of the game, the Kinect is the perfect controller and operates flawlessly when it really counts. 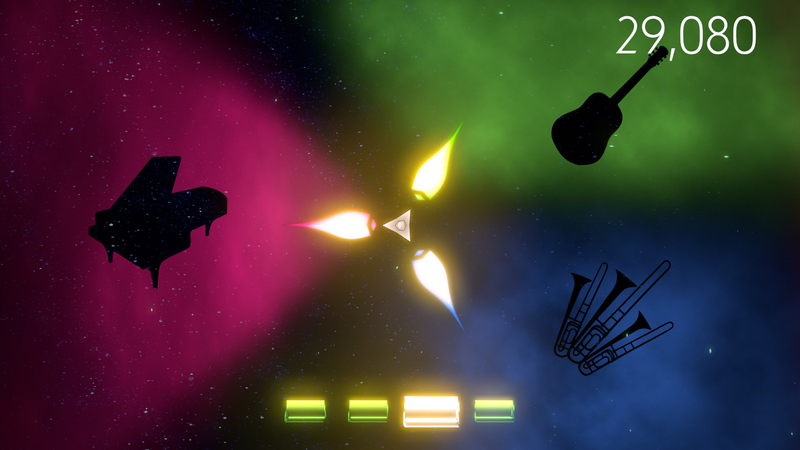 The music is highly recognizable, yet manages to stay fresh and avoid the bland quality that can accompany over-played tracks through a mix of unique gameplay and fresh remixes. While some of the stuff that has been put out by Miramax and Touchstone would make Walt turn over in his grave, I can say with full confidence that this game would fall squarely in his mission of creating quality entertainment for everyone from age 2 to 102. Gameplay on Kinect that doesn't make you want to smash it? 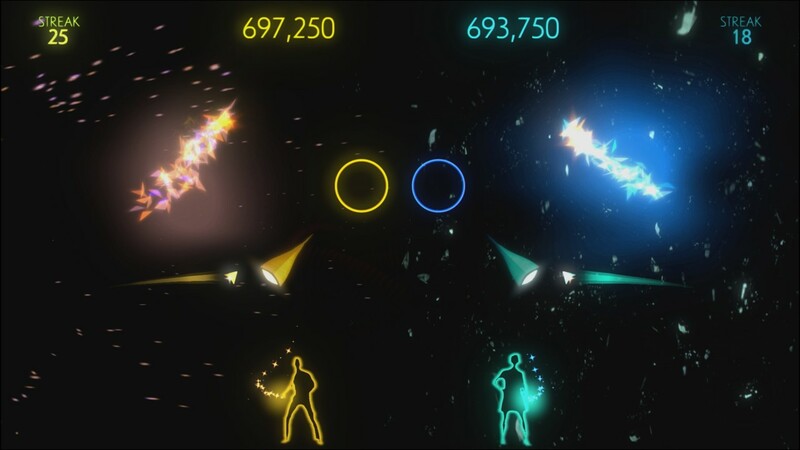 Although some of the titles that have been released for the Kinect work questionably at their best and are exercises in testing one's self-control to keep from taking a Louisville Slugger to the gadget at worst, Fantasia is one of, if not the best title to be released for the amazing yet imperfect piece of technology. While there is no question that the Kinect is an astonishing piece of equipment when it comes to motion capture technology, it has often fallen woefully short of expectations in practice. It is undoubtedly that lack of follow-through that led Microsoft to un-bundle it from their next-gen console this past May. That is really sad news for anyone who has played Fantasia: Music Evolved, because it appears they are finally figuring out how to use it properly. The “mouse pointer” in Fantasia is creatively titled “The Muse” after the mythological female Greeks who inspired music, literature, and the arts. Although it could be frustrating at times to operate, it was probably the best motion detection controller I’ve used on any system including the Wii. This game is supposed to be the least glitchy of all the Kinect titles to date, but it still had a bump or two in the road. That said, it’s amazingly accurate for a motion sensor. Really the only aggravating part about using the Kinect was maneuvering around the various Realms menus used for choosing songs and progressing through the game. Once you were in the actual song part of the game using triggers during play, it was pretty seamless. The only other problem I found with the game was a bit of HDTV lag that I've found is present in all music titles. I’m a classically trained violinist so I’m especially attuned to minor issues with pitch and rhythm. Just as in Rock Band and Guitar Hero, this issue was easily fixable with a small amount of fiddling with the calibration in the Options menu. Enough complaining, get to the game already! 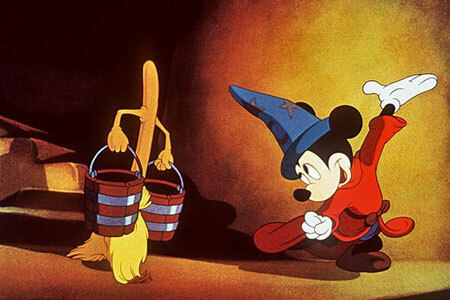 The game itself is loosely based upon the Sorcerer's Apprentice portion from the original film. You are Yen Sid's (Mickey's old boss) newest apprentice. He has taken you under his wing to teach you the ways of wizardry and magic. Once you've earned your hat (The same one that got Mickey in such trouble) through a series of training exercises that teach you the mechanics of the game, the real fun begins. Sid leaves you alone in his workshop and you meet Scout. It's never really clear what Scout's job is. It appears that she may have been a previous apprentice who decided she could learn more on her own, but she's still hanging around Sid's workshop fiddling with spells for some reason. 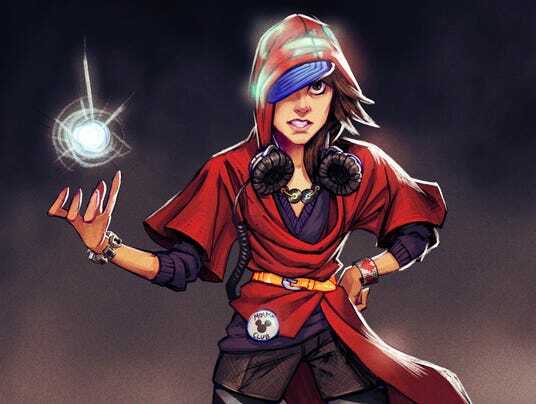 Whatever her backstory, Scout convinces you to try out your new skills on a spell she's been working on. The outcome is about the same as what happened to Mickey and you release an entity called "The Noise" that destroys all art and music. As luck would have it, Sid has chosen this time to run out for groceries even though he "NEVER leaves the workshop," according to Scout. That means it's up to you and your new companion to do your best to contain the evil spell you've released and keep it from destroying all the music and art in its path. You do this by correctly playing one of the most wide-ranging yet high quality soundtracks I've heard in a game. Well-known game composer Inon Zur (Fallout 3, Dragon Age: Origins), no relation to the weekend weapons salesman from Destiny, did a fantastic job with the music selection and remixing for this game. The songs vary massively with everything from The Flaming Lips and Cee Lo Green to Mozart and Tchaikovsky, but always manage to keep the energy level up and the game entertaining. Each track is playable as the original version, as well as two "remixes" in specific other musical styles. The new-style remixes of familiar tracks don’t offend as they so easily could have, but simply add some unique touches to songs most of us have heard a hundred times before. If anything, it manages to keep the game from getting bogged down in familiarity rather than having a soundtrack of oft-played songs make a good game seem outdated. You are able to switch from the original track to one of the two remixes mid-song. Called a "Cue Switch," a circle will appear mid-screen during a song and you have to punch through it, then swipe your hand in one of three directions, thereby choosing which version the game will play next. You have several opportunities throughout each track to switch up the style, creating your own personal on-the-fly remix of the multitude of classics in the game's soundtrack, some as old as Bach and Dvorak and as new as Gorillaz and Lady Gaga. Now that we know it works, how do you play the stupid thing?! Swipe – Move your hand in the direction of and in time with a ball through a small, arrow-shaped opening. It doesn’t seem to matter which hand you use, as long as it’s going in the right direction. Punch – Punch a hole through colored circles that appear on the screen in time with the ball, once again. Punch and hold – You punch through the colored circle, as before, but this time you hold your fist in the position of a second colored circle until it disappears. This is usually for long-held notes like whole notes and multiple measures. Punch and swipe – For this, you again punch through the colored circle, but when finished you have to move your arm slowly in time with the music along a section of brightly colored lines. These seem to occur during slurred notes where several notes are played but, with a violin, for example, the bow would never change direction. Eighth and sixteenth notes are prime examples where 4-16 notes would be played quickly in succession. This may seem like a fairly small collection of movements, but trust me, when they're sixteenth notes, syncopated, coming at you at 100 bpm, it's plenty! There are five primary realms in Fantasia. 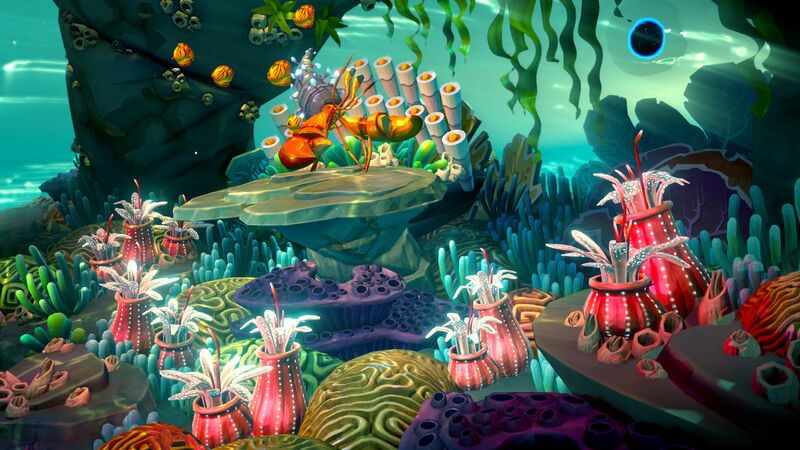 Each has its own theme such as the underwater "Shoal" seen above. Once you have completed these five levels, new ones become available. Each realm has two or three songs in it, and each song has the original track plus two remixes. You must make certain goals in order to open the remixes, but they are fairly conservative and I never had a problem hitting the mark required to gain access to a remix. Your goal in each realm is to open a Composition Spell. These are made up of various mini-games that allow you to add a personal touch to the soundtrack. Bonuses: +1 for the smooth and unique gameplay that is unlike anything I've ever seen before. Kudos to Harmonix for originality in creating a truly distinctive gaming experience. Penalties: -1 for the standard difficulties that all motion sensor games seem to have when it comes to menus. It was just really hard to get the "Muse" to settle on the spot where you wanted it to go. It wasn't ever bad enough to get me to yell at the TV, but it was mildly annoying.